Directions: Mix together marinade ingredients and place in a zip lock bag with 4 chicken breasts. Let marinade for at least 2 hours in the fridge, or overnight. Tip: Works even better if you tenderize the chicken breasts and poke a few holes in them before placing them in the bag with the marinade. Grill chicken on BBQ or cook in a skillet. Cut chicken into thin slices against the grain to get very tender slices of chicken. Cook a box of quinoa noodles according to the directions on the box and heat marinara sauce in a pot on the stove. 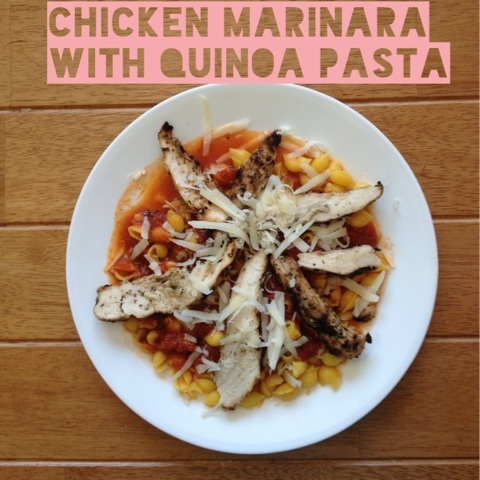 Toss noodles in marinara sauce and serve chicken on top. Makes 4 servings.